Questo articolo è stato tradotto in italiano. Clicca QUI per la versione tradotta. 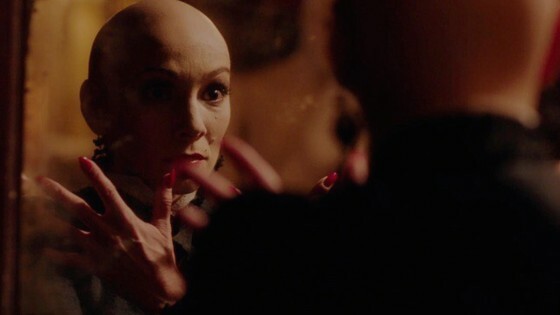 Peter Strickland’s In Fabric views commercial consumption as a nexus point for the natural and supernatural, distilling horror and satire out of the desire for beauty, status, and happiness through material means. Taking a department store and a bank as its backdrop, the film’s centerpiece -a red dress with seemingly sinister powers that changes hands over time- serves as an allegory of sorts for capitalist institutions. The film made its world premiere in the Midnight Madness program at the 2018 Toronto International Film Festival to relatively high anticipation, given Strickland’s previous feature The Duke of Burgundy (2014), which, since the release of that film, has set a specific (and admittedly reductive) precedent for the reception of his cinema at large: that his works are pastiche, and a collective homage to European genre films of the 1960s and 1970s. While this is true at face value, it is not true by necessity, as pastiche for Strickland is merely a template through which to view other subjects. The narrative of In Fabric is primarily a device to extrapolate the artifice of institutional spaces, the figures who inhabit them, and the material objects they produce. The proprietors of the Dentley & Soper department store (Fatma Mohamed and Richard Bremmer) greet customers with arch dialogue and long, unnatural pauses. The store space itself is distinguished by amplified whispers heard throughout scenes taking place there. One of their patrons is Sheila (Marianne Jean-Baptiste), who works at a bank where she often reports to a pair of managers (Julian Barratt and Steve Oram), whose dialogue seems scripted by corporate boilerplate and whose office features a closet of Renaissance costumes. Sheila’s purchase of a red dress starts a chain of supernatural events wherein the dress later comes into the hands of newlyweds Reg and Babs (Leo Bill and Hayley Squires), who eventually cross paths with the bank and department store, respectively. It is against this landscape of spaces where material goods are either bought or financed (stores and banks) and their wares (a dress and washing machine) that the film finds horror and satire. That In Fabric never explains the supernatural events suggests that the viewer is not meant to deduce what’s happening onscreen but rather to experience the abject and absurd in what Strickland sees as insular societies. In Fabric is divided into two parts, and uses artifice to complicate the passage of time between them. The film never explicates when both portions of the story take place -though Sheila’s mail-based dating service and rotary telephones suggest that the first half takes place in ‘the past,’ while Reg’s eyeglass frames and certain elements of decor suggest that the latter half takes place in ‘the present’- largely to demonstrate that the department store, the bank, and the dress remain unchanged. This is at odds with the fleeting nature of fashion at large, with clothing going in and out of style over time. Yet in keeping the store, its wares, and its advertising the same, Strickland renders them as absolute -a presence with no origin or conclusion that exists outside of temporal reality. The film contains many of the visual allusions that the viewer has come to expect from a Strickland film. In a scene where Mohamed performs an oblique ritual with a menstruating mannequin, she holds a bloodied hand to her lips. A seasoned viewer of European fantastique will recall Franka Maï applying animal blood as lipstick in Rollin’s Fascination (1979). Two sequences feature washing machines as a source of sound that is at once diegetic and non-diegetic: The dress is run through the wash, causing the machine to spin out of control and disintegrate, and in the latter sequence, bleed. At the same time, both stand in for music in generating tension in certain scenes. Visually these scenes take their cue from Ruggero Deodato’s The Washing Machine (1993). A sequence where Babs describes a dream of giving birth recalls one from Roger Vadim’s Blood and Roses (1960), a progenitor of European genre cinema at large. The viewer will note the comedic use of dialogue rather than proper comedic dialogue, such as Mohamed’s use of archaic English and passive voice (“Lamentations can be addressed to…”) in place of contemporary active voice (“You can direct your complaints to…”). Because In Fabric is a largely English production and the dialogue is in English, the viewer could ostensibly understand the flowery dialogue to be a humorous play on many of the English language translations of mid-century fantastique -such as the English dubbing of George Hilton- as well as English-language productions from that time and place -such as Harry Kümel’s Daughters of Darkness (1971). Mohamed’s diction in In Fabric is not unlike Delphine Seyrig’s in Daughters of Darkness in that it forms part of a larger artificial landscape that is the character’s persona. The garrulous dialogue in her case, then, can be understood as a means of seduction, enticing store patrons to spend money. Artifice is used in the film’s portrayal and mockery of institutional power structures -which often manifest themselves in language. Strickland has stated that one of the inspirations for the film was The Office by Ricky Gervais. Strickland and Gervais were both born and raised in Reading, a center for corporate offices and business parks -including the UK headquarters for Microsoft- and it is through the use of ‘human relations’ dialogue that Barratt and Orem serve as a caricatures of workplace bureaucracy. Consider a scene where the two become sexually aroused at Reg’s description of repairing a washing machine, which recalls the paraphilia related to household chores depicted in The Duke of Burgundy. Artifice and allusion do not merely function as an exercise in In Fabric but as a means of distilling horror from its subject. While the film denotes insular groups performing bizarre rituals, it connotes the greater horror of faceless institutions. When interviewed at Toronto, Strickland traced the genesis of the film to his experience with department stores, describing them as “…like other worlds, almost like museums,” and of being frightened of mannequins in those stores as a child. With that in mind, consider the film’s conflation of consumer praxis and sexuality, as with a scene where Mohamed fondles the fabric of the dress and eventually Sheila’s hand in order to ‘sell’ her on it, or a flashback to Reg’s childhood where he is sexually aroused by the sight of a female shopkeeper’s legs. The store also functions as a liminal space between the natural and supernatural: Advertisements for Dentley & Soper -filmed in the vintage grain of a late-1970s television camera and featuring the shop girls’ gesturing toward the viewer to enter the store- induce hypnosis in their viewers. The structure of In Fabric is not unlike that of a mail-order catalog in that the film contains ‘chapter breaks’ featuring blown-up still fashion and street photography. These sequences suggest the cognitive noise of dreams that Freud described in Die Traumdeutung, and who Cocteau would later liberally apply to The Blood of a Poet (1930). The bankers and shopkeepers of In Fabric incite characters to recall their dreams, often causing the speaker or themselves to enter a trance. These sequences function in the same way as most advertising, presenting consumer praxis as an idyllic, often sexualized state. A hanging sign reading “The Transformation Sphere” appears late in the film, identifying the store’s changing rooms. The changing room and the act of changing clothes serves as a device for setting supernatural events into motion. One might compare the scene where Sheila first tries on the red dress to a sequence in Herk Harvey’s Carnival of Souls (1962) where Mary changes out of a black dress she has just tried on. Both instances at once indicate a turning point narratively for the film and an entrance into a nebulous space where supernatural forces emerge. In Harvey’s film, the image blurs slightly as Mary changes, while in Strickland’s film, the dress itself produces a scar on Sheila’s chest. “The Transformation Sphere” speaks indirectly to the body’s relationship to clothing as it pertains to the performative. Strickland sees a source of horror in how one’s identity is woven through with one’s self-presentation. Clothing functions as a marker of identity values -the most prominent being, arguably, social class- in the same way, according to Pierre Bourdieu’s Distinction (1979) and Paul Fussell’s Class (1983), as one’s consumption of books, films, and music. In North America, for instance, the identity value of the Sperry brand or madras cotton (the so-called ‘Ivy League’ look) differs from that of the Carhartt brand or carpenter cut denim jeans, both performative identities being predicated largely on socioeconomic status. It is perhaps not a coincidence, then, that unlike the explicitly fantastique settings of Berberian Sound Studio and The Duke of Burgundy, In Fabric takes place in a largely working-class world. The exchanges between Sheila and her boyfriend (Barry Adamson) and son (Simon Manyonda) and between Reg and Babs form a binary with the arch relationships between Mohamed and Bremmer and between Barratt and Oram. One notices this is in a relatively unpleasant scene late in the film, where the proprietor harangues Babs on her appearance and accent, mocking her use of the word “mate.” Though Mohamed is Romanian by origin and clearly speaks with a Romanian accent, the conversation addresses variations in the English accent to imply conflict between social classes -specifically Upper Received Pronunciation, or ‘posh’ English (implying moneyed upbringing and elite education), and East London or Cockney English (implying the working class). That the film goes to great lengths to establish the store employees’ convoluted language bolsters the film’s image of the upper classes as artificial. 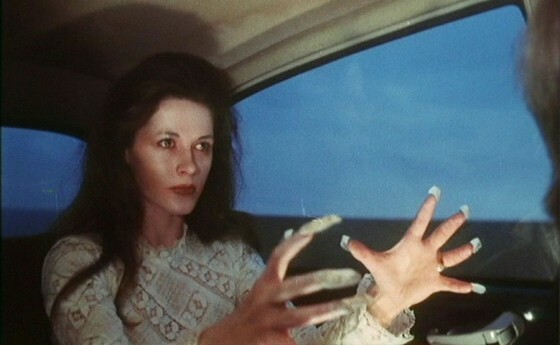 In the span of only six years, the reception of Strickland’s films has come to rely on his ‘channeling’ of 1970s genre cinema. This reception -to compare Mohamed’s proprietor, for instance, to Mary in Martino’s All the Colors of the Dark (1972) or to Miss Tanner in Argento’s Suspiria (1977)- is reductive, however, given how one filmmaker might use pastiche as simple homage and another will use it as a template to explore something else. With In Fabric, Strickland has used the language of European horror and fantastique to form a critique of consumerism, capital, and money, portraying the bankers’ team-building exercises and clothiers’ commercial spots as a kind of alchemy or magic. At its premiere, the director described In Fabric as “…a consumerist nightmare, ‘consumerist’ with a small c, because it’s not a lecture.” With that in mind, the film arguably has more in common with George Romero’s Dawn of the Dead (1978) -which uses the zombie as symptomatic of modern consumerism- or Rollin’s Fascination (1979) -which uses vampirism allegorically in its portrayal of the French social classes- than with films that typify the giallo genre. Yet any conversation on the topic of ‘consumerism,’ satirical or not, is implicitly beholden to the topics of capitalism and social stratification. Mohamed becomes a Faustian figure in that sense, given the historical relationship between the story of Faust and the promise of personal wealth, and by extension, happiness. In Fabric [id., 2018] di Peter Strickland descrive il consumismo come un punto di incontro tra naturale e soprannaturale, filtrando l’orrore e la satira dal desiderio di bellezza e felicità raggiungibili attraverso mezzi materiali. Eleggendo a luoghi chiave un grande magazzino e una banca, il fulcro del film – un vestito rosso con poteri apparentemente sinistri che passa di mano in mano – funziona come un’allegoria delle istituzioni capitaliste. Il film è stato presentato in anteprima mondiale nel programma Midnight Madness al Toronto International Film Festival 2018 accompagnato da un’attesa abbastanza considerevole, dato che il precedente film di Strickland, The Duke of Burgundy [id., 2014], ha offerto una chiave di lettura specifica (e certamente riduttiva) del suo cinema: ovvero che le sue opere siano pastiche, omaggi collettivi ai film di genere europei degli anni ’60 e ’70. Ma questo è vero solo superficialmente, in quanto il pastiche, per Strickland, è semplicemente un template attraverso cui mettere in immagini altri tipi di questioni. Una cosa da tenere a mente quando si guarda un film di Strickland è che esso sposta deliberatamente l’attenzione dello spettatore sull’«artificio» del cinema […], e che i riferimenti dei suoi film al genere fantastique europeo degli anni ’70 sono più ideologici che formali. Il cinema di Strickland non tratta artisti del calibro di Jesus Franco, Jean Rollin, Walerian Borowczyk e altri come fonte di emulazione, quanto piuttosto come punto di partenza. Ha detto Strickland, nel 2014: «Molti di questi film sono decisamente poco educati [unpolished]; ciononostante, hanno sempre qualcosa di incredibilmente strano, brillante ed affascinante. Non è importante il fatto che siano film perfetti; si tratta piuttosto di trovare, in essi, determinati “momenti”. […] Nel complesso, questi film sono piuttosto irregolari; per me si tratta di vedere qualcosa di unico anche se imperfetto. Anche se uno di questi film è brutto, è sempre possibile trovare qualcosa di originale». La narrazione di In Fabric è innanzitutto un espediente per estrapolare l’artificiosità degli spazi istituzionali, delle figure che li abitano e degli oggetti materiali che essi producono. I proprietari dei grandi magazzini Dentley & Soper (Fatma Mohamed e Richard Bremmer) accolgono i clienti con dialoghi elaborati e lunghe pause innaturali. La banchiera Sheila (Marianne Jean-Baptiste) pronuncia battute che sembrano scritte da un corporate boilerplate […]. L’acquisto di un abito rosso da parte di Sheila scatena una serie di eventi soprannaturali che lo porteranno, in seguito, nelle mani degli sposi Reg e Babs (Leo Bill e Hayley Squires), che, alla fine, incroceranno la propria strada, rispettivamente, con la banca e il grande magazzino. È nei confronti di questi spazi, in cui i beni materiali vengono acquistati o finanziati (negozi e banche), che il film fa scaturire l’orrore e la satira. Perché In Fabric non spiega mai i propri eventi soprannaturali, suggerendo che lo spettatore non deve dedurre ciò che accade sullo schermo, ma, piuttosto, fare i conti con ciò che Strickland trova di abietto e assurdo nella società. In Fabric è diviso su due piani temporali, e il passaggio da uno all’altro avviene in modo artificioso. Il film non spiega mai quando questi salti temporali hanno luogo – sebbene il servizio di appuntamenti per posta e i telefoni fissi di Sheila suggeriscano che la prima metà di In Fabric si svolge nel passato, mentre la montatura degli occhiali di Reg e alcuni elementi del décor inducono a pensare che la seconda metà ha luogo nel “presente” –, mostrando sempre invariati il grande magazzino, la banca e il vestito. Ciò è in contrasto con la natura mutevole della moda […]. Tuttavia, mantenendo il negozio, le sue merci e la sua pubblicità sempre identici, Strickland li rende “assoluti” – una presenza senza inizio o fine, che esiste al di fuori della realtà temporale. Il film contiene molte delle allusioni visive che lo spettatore si aspetta da un film di Strickland. In una scena in cui Mohamed esegue un ambiguo rituale con un manichino con le mestruazioni, la donna tiene una mano insanguinata sulle sue labbra. Uno spettatore amante del fantastique europeo ricorderà Franka Maï che utilizza il sangue animale come rossetto in Fascination [id., 1979] di Rollin. Due sequenze, poi, hanno come fonte di suono diegetico e non diegetico delle lavatrici: il vestito viene lavato, causando però la rottura della macchina e, nella seconda sequenza, un dissanguamento. Visivamente queste scene prendono spunto da Vortice mortale (1993) di Ruggero Deodato. Una sequenza in cui Babs descrive il sogno del parto ne ricorda una di Roger Vadim, Il sangue e la rosa [Et mourir de plaisir, 1960], uno dei primi esempi di cinema di genere europeo. L’artificiosità è utilizzata nel film col fine di rappresentare e deridere le strutture di potere istituzionali – che spesso si manifestano nel modo di parlare dei singoli personaggi. Strickland ha dichiarato che la serie The Office di Ricky Gervais è stata una delle fonti d’ispirazione del suo film. Strickland e Gervais sono nati e cresciuti a Reading, un centro per uffici aziendali e parchi commerciali, fra cui la sede inglese di Microsoft, ed è proprio attraverso l’utilizzo di un linguaggio tipico delle human relations che Barratt e Orem funzionano come caricature della burocrazia sul posto di lavoro. Si consideri a tal proposito una sequenza in cui i due si eccitano sessualmente quando Reg descrive la riparazione di una lavatrice, che richiama la parafilia legata alle faccende domestiche di The Duke of Burgundy. L’artificio e l’allusione consentono all’orrore di emergere. Mentre In Fabric mette in scena gruppi isolati che eseguono bizzarri rituali, connota il più grande orrore delle istituzioni senza volto. Quando è stato intervistato a Toronto, Strickland ha ripercorso la genesi del film attraverso la sua esperienza con i grandi magazzini, descrivendoli «… come altri mondi, quasi come musei», raccontando come da bambino avesse paura dei manichini presenti in quei negozi. Si veda, ad esempio, come il film confonde le abitudini tipiche del consumatore con la sessualità – come quando, in una sequenza, Mohamed accarezza la stoffa del vestito e, alla fine, la mano di Sheila; oppure durante un flashback dell’infanzia di Reg, che si eccita sessualmente alla vista delle gambe di una negoziante. Il negozio funziona inoltre come uno spazio di confine tra naturale e soprannaturale: le pubblicità per Dentley & Soper – realizzate con la grana vintage di una telecamera della fine degli anni ’70, in cui delle ragazze invitano chi guarda ad entrare nello store – inducono l’ipnosi nei loro spettatori. La struttura di In Fabric non è dissimile da quella di un catalogo di vendita per corrispondenza, in quanto il film contiene “interruzioni di capitolo” che mostrano immagini fisse di moda e fotografie di strada. Queste sequenze suggeriscono quei processi cognitivi dei sogni che Freud descrisse in Die Traumdeutung, e che Cocteau avrebbe poi liberamente applicato a Il sangue di un poeta [Le sang d’un poète, 1932]. I banchieri e i negozianti di In Fabric incitano i personaggi a ricordare i loro sogni, facendoli spesso entrare in trance. Queste sequenze funzionano allo stesso modo della maggior parte della pubblicità, presentando l’essere consumatori come uno stato idilliaco, spesso sessualizzato. Un cartello appeso con la scritta “The Transformation Sphere” appare più avanti nel film, identificando gli spogliatoi del negozio. Lo spogliatoio e l’atto di cambiarsi d’abito funzionano come un dispositivo che provoca eventi soprannaturali. Si potrebbe paragonare la scena in cui Sheila prova per la prima volta il vestito rosso a una sequenza del Carnival of Souls [id., 1962] di Herk Harvey in cui Mary si toglie il vestito nero che ha appena provato. Entrambe le istanze indicano contemporaneamente una svolta narrativa per il film e l’ingresso in uno spazio nebuloso in cui emergono forze soprannaturali. Nel film di Harvey, l’immagine sfuma leggermente mentre Mary si cambia, così come nel film di Strickland l’abito stesso provoca una cicatrice sul petto di Sheila. Non è forse una coincidenza, quindi, che a differenza delle ambientazioni esplicitamente irreali di Berberian Sound Studio e The Duke of Burgundy, In Fabric si svolga in un mondo in gran parte operaio. […] Il fatto che il film si concentri sul linguaggio contorto dei dipendenti del negozio rafforza la natura artificiale delle upper classes di In Fabric. Nell’arco di soli sei anni, i film di Strickland sono stati analizzati perlopiù come variazioni intorno al cinema di genere degli anni ’70. Quest’accoglienza – che implica, ad esempio, fare un confronto fra il superiore di Mohamed con il personaggio di Maria in Tutti i colori del buio (1972) di Martino o di Miss Tanner in Suspiria (1977) di Argento – è tuttavia riduttiva in quanto un cineasta può usare il pastiche come semplice omaggio oppure come modello per esplorare altro. Con In Fabric, Strickland ha utilizzato il linguaggio dell’horror e del cinema fantastico europeo per costruire una critica al consumismo, al capitale e al denaro, rappresentando gli esercizi di team building dei banchieri e gli spot commerciali dei clothier come se fossero rituali alchemici o di magia. In occasione della presentazione del film, il regista ha descritto In Fabric come “… un incubo sul consumismo, dove ‘consumismo’ è con la “c” minuscola, perché non siamo a una lezione universitaria.” Il film ha probabilmente più in comune con Zombi [Dawn of the Dead, 1978] di George Romero – che usa la figura degli zombi come metafora del moderno consumismo – o Fascination di Rollin – che usa il vampirismo come un’allegoria delle classi sociali francesi – piuttosto che come semplice omaggio al genere giallo. Tuttavia, qualsiasi riflessione sul tema del “consumismo”, satirica o meno, è implicitamente legata ai temi del capitalismo e della stratificazione sociale. Mohamed è una figura faustiana in questo senso, ovvero considerato il legame tra la storia di Faust e la promessa di ricchezza e felicità personali.